Today is Global Tiger Day, an annual celebration first conceived in 2010 at the St. Petersburg Tiger Summit as a way to help raise awareness for tiger conservation. The tiger (Panthera tigris), Asia's king of the jungle, has an impressive list of honors to its name: It's been eulogized in song and poetry, immortalized in Chinese and Malay idiomatic expressions, and designated the official animal of four Asian nations and one summer Olympic Games. Across Asia, it has historically been admired as a symbol of power, strength, leadership, and protection. These days, however, the endangered tiger's prospects are looking less than rosy. In just the past century, tigers have disappeared from a shocking 93% of their historic range; three of the nine distinct subspecies have gone extinct, with one more subspecies now believed to be extinct in the wild; and of the 100,000 tigers that freely roamed at the turn of the 20th century, so many have died as a result of human activity that as few as 3,200 remain today. To commemorate today's occasion, we decided to take a look at the important cultural role tigers have played in some of the 13 countries where they can still be found — and to highlight what still needs to be done to ensure this legendary beast's survival. For the Chinese, tigers can quite literally be labeled royalty. The black markings on their foreheads sometimes resembles 王, the Chinese character for "king" — perhaps making them fitting mounts for Tsai Shen Yeh, the Chinese god of wealth, who is often depicted sitting on a tiger. Infants were traditionally given shoes embroidered with tiger faces to protect them against evil, and this tradition persists even today in the Chinese countryside. The tiger native to China is the South China tiger (P. t. amoyensis), the most critically endangered of the six remaining subspecies. As recently as the 1950s, there were an estimated 4,000 tigers in China; after decades of being hunted as a pest and for the value of its parts in traditional Chinese medicine, however, the South China tiger is now considered "functionally extinct" because it hasn't been seen in the wild for over 25 years. The Chinese government outlawed hunting in 1979, but the black market for tiger parts is a thriving one that is largely to blame for declining tiger numbers in nearby countries. Save China's Tigers is a foundation established in 2000 with the controversial goal of "rewilding" captive tigers. Currently, tigers are being bred and rehabilitated at Laohu Valley Reserve in the South African province Free State. The effectiveness of this program remains to be measured, as all the South China tigers still living and being bred today are descendants of only six individuals, and no large predators born in captivity have ever been successfully reintroduced into the wild. The tiger's significance in India extends back more than 5,000 years. The emblem on coins made during the reign of one monarch in southern India's Chola dynasty is of a tiger facing two fish, and from the even more ancient Indus Valley Civilization comes the Pashupati seal, which shows Hindu deity Pashupati surrounded by animals, including a tiger. Pashupati is believed to be an incarnation of Shiva, another Hindu deity, who is coincidentally usually depicted wearing or sitting on top of a tiger skin. This is thought to symbolize his mastery over Durga, goddess of power and force, as she is often portrayed astride a tiger. The Bengal tiger (P. t. tigris), national animal of India and Bangladesh, constitutes half or more of the global tiger population. This is in large part thanks to Project Tiger, which was launched in India in 1973. The project facilitated the creation of numerous tiger reserves that brought the Indian tiger population to a height of 3,750 in 1993, the same year that an international ban on tiger trade was introduced. 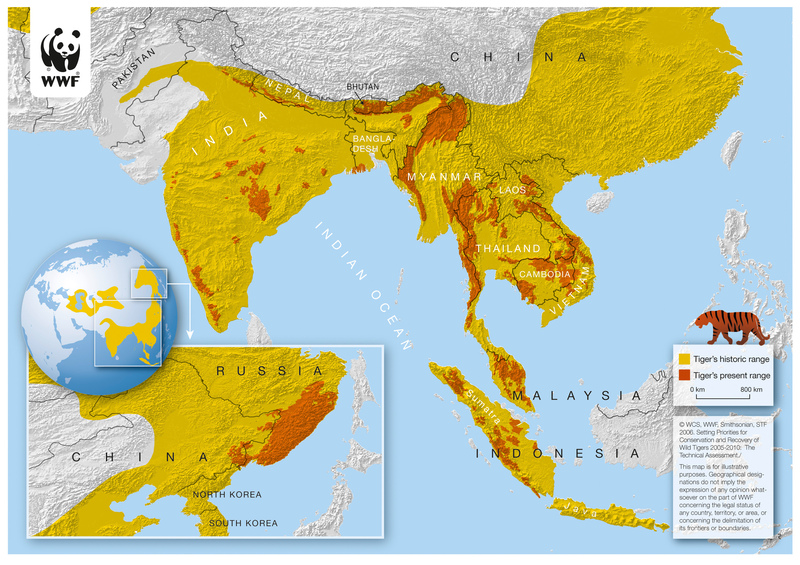 These gains are being lost at an alarming rate, however, due to habitat fragmentation, prey loss, conflict with humans, and, most significantly, continued poaching to meet a burgeoning illegal demand for tiger parts. Though the Malayan tiger (P. t. jacksoni or P. t. malayensis in Malaysia) wasn't recognized as a separate subspecies until 2004, the tiger has long been a source of Malaysian national pride. Malaysia's official national animal is the Malayan tiger, which featured in the flag and coat of arms of the former Federated Malay States and still holds a prominent place in the Malaysian coat of arms. It also appears in the heraldry of the Royal Malaysian Police, Maybank, automobile manufacturer Proton, and the Football Association of Malaysia. Affectionately referred to as Pak Belang (Uncle Stripes), the Malayan tiger plays a starring role in many Malay folk tales and Malay proverbs; one example is "Duduk seperti kucing, melompat seperti harimau" ("Crouches like a cat, leaps like a tiger"), an idiom used to describe a quiet but brave person. The Malayan tiger, previously grouped with the Indochinese tiger (P. t. corbetti), numbers around 500 in the wild. The biggest threat it faces is the conversion of its habitat to plantations, which leads to frustration for farmers when tigers prey on livestock. Tigers are often killed in retaliation and subsequently sold on the black market. In 2010, the World Wildlife Fund-Malaysia launched the TX2 campaign with the objective of doubling the wild tiger count by 2022. Jennifer Shyue is a contributor to Asia Blog. Originally a Brooklynite, she is currently a student at Princeton University.